Soups, stews, and chili's are on the minds of many as the fall cooking season rolls around. This Butternut Squash Soup is Jean George's recipe, that I was privileged to observe in a cooking demo, years ago. Ten plus years later, I went to the famous Jean George's in New York, (Trump Hotel Central Park, first floor) and had this very soup!! 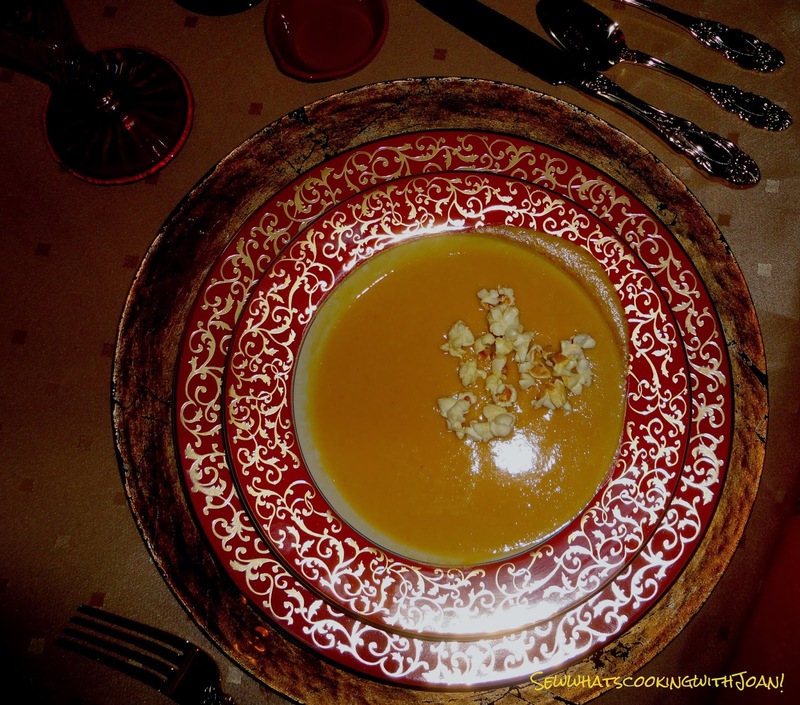 Ever since then, I’ve fallen in love with Jean George's Butternut Squash Soup. In fact as I write this, October is only half way, and I’ve already made it twice! The only recipe that I will ever use for the rest of my life belongs to Jean-Georges Vongerichten. And today, I will share it with you. It’s not a secret, actually. 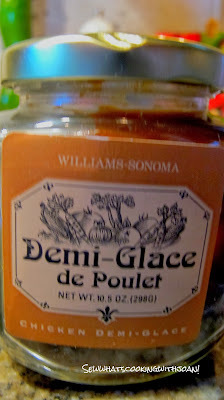 I’ve come across the recipe in a few places, including a demo that he did on Good Morning America in 1998! The first time that I made it, I was pleasantly surprised at the short ingredient list and simple preparation method. Is it possible that something so amazingly delicious could be this simple to make? The answer is, Yes! 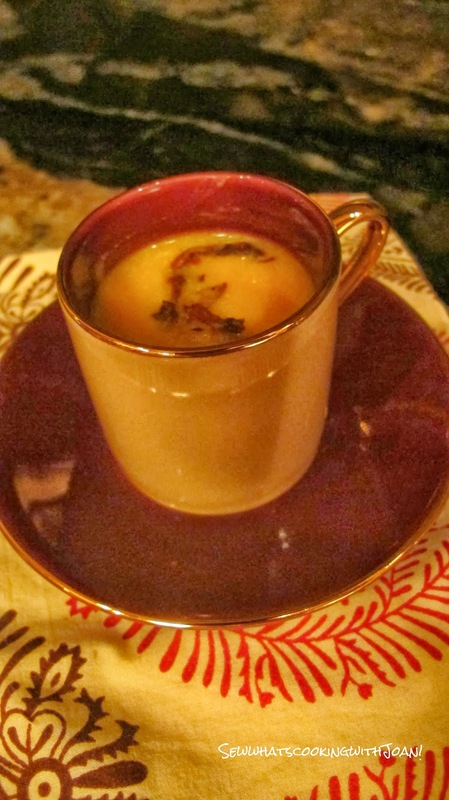 Everyone raves about this soup! 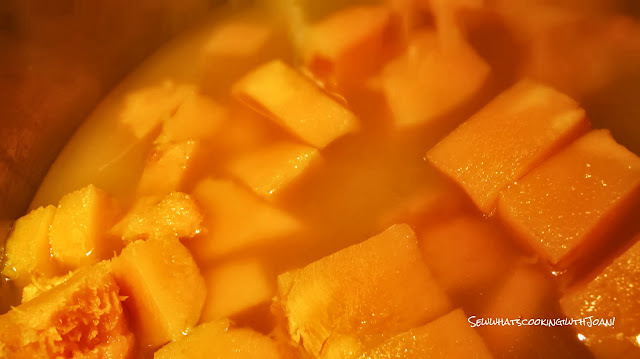 Combine the squash and stock in a saucepan and bring to a boil. 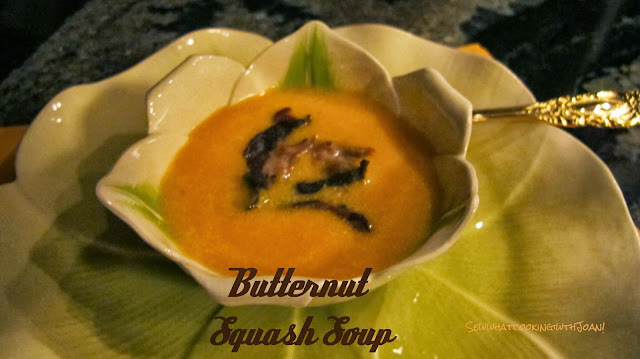 Reduce heat and simmer until squash is very tender, about 20 minutes. Cool slightly, then puree in a food processor or blender. Return to heat and stir in the cream of your choice, the butter, salt, pepper and caryenne. Cook stirring until heated through (do not boil). Taste, add the sugar, and adjust seasoning. Garnish......I garnished with sauteed chanterelle mushrooms this time, but have garnished with three buttered and salted popcorn or snipped chives! 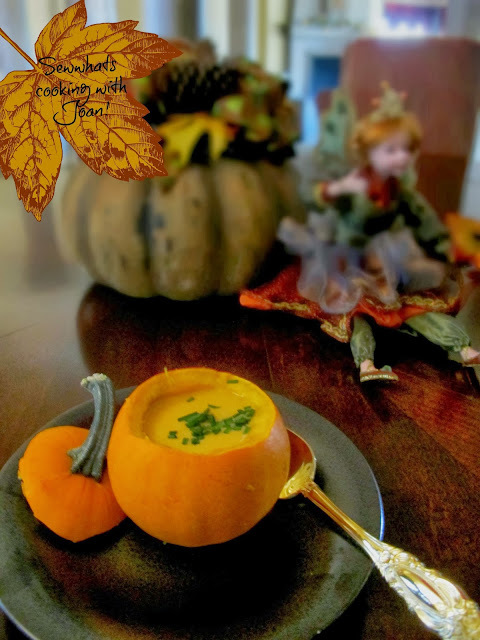 Thanksgiving is around the bend, and if ever there was a time for a simple-to-make (but still amazing) holiday soup, this is it. And what’s more, you can make it ahead of time, freeze it in batches, and use some for Christmas – or a quick mid-week meal during the bleak winter’s pale. This I made a few years ago at Thanksgiving, in our Scottsdale home. This is not the Jean Georges recipe, however, I wanted you to see the options of garnish and how each looks. In this case, I serve a very tiny bowl of buttered popcorn on the side of each serving of soup. I used snipped chives in this presentation...yum! 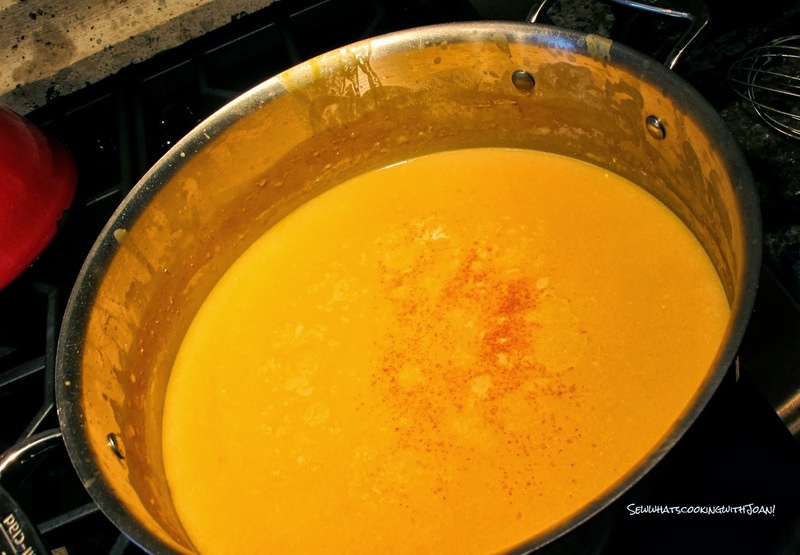 I think I'm in danger of overdosing on Jean George's butternut squash soup...and we are just November 1!! wow yummy in delighted color pure food you have shared. Fast and Easy Halloween Treats Part 2! Fast and Easy cookies and treat's for Halloween! Pumpkin Cookies with Penuche frosting!